Achy Joints, irritability, fatigue, brain fog, depression, weight gain—does this sound like you? If so, the foods you eat every day may be to blame. Discover how amazing you can feel using the power of the Elimination Diet! Yes—there is an age-old, powerful connection between what you eat and how you feel. Just as no two bodies are the same, no two diets work for everyone. The only way to discover your ideal diet is to follow an Elimination Diet that will help you link foods to symptoms and customize a diet that works for you. 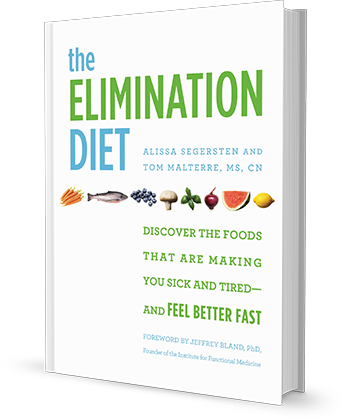 Complete with 125 delicious recipes, shopping lists, and meal plans, The Elimination Diet is a complete functional medicine resource for you to improve your health and feel better, naturally. And get some FREE Bonus Gifts! Our Elimination Diet Cookbook containing all new Phase 1 & Phase 2 recipes. Our Elimination Diet Quick Start Guide detailing what you can do now to prepare for your Elimination Diet. Once you have made a few large batches of both the Chicken Stock and the Vegetable-Seaweed Stock (both recipes in The Elimination Diet Book), anything is possible when it comes to soup. Using one of those stocks as a base, you will be able to quickly whip up a pot of soup that can nourish you throughout the week. This recipe can be made very quickly; serve it with leftover cooked brown or white jasmine rice. Place the stock into a 4-quart pot and bring to a gentle boil. Add the chicken, ginger, salt, daikon radish, and carrots, cover, reduce heat to low and simmer for 15 to 20 minutes. Add the napa cabbage and simmer a few minutes more. Taste and adjust salt if desired. Ladle soup into bowls and sprinkle each with the garnishes. Variation: Replace the chicken with cubed organic tofu when you are challenging soy at the end of phase 3. Keep these bars in your freezer for the times you are feeling very hungry and in need of a nutrient-dense snack immediately. We use Omega Nutrition pumpkin seed butter. Look for it at your local health food store or order it online. Line a 9 x 5-inch glass bread pan with parchment paper. Place the dates, shredded coconut, currants, cinnamon, and vanilla powder into a food processor fitted with the “s” blade. Process the mixture for about 30 seconds, and then add the remaining ingredients. Process again until combined. Pour mixture into the prepared bread pan. Place into your freezer for about 1 hour to set. Then cut into bars with a very sharp knife. Serve. Keep bars in the freezer until ready to serve—they will become soft at room temperature. I'm looking for the FREE resources mentioned in the book. You can find all of the free PDF downloads for The Elimination Diet book here in this article. I am new to eating this way and feeling overwhelmed, how do I stay on track? It can be a little overwhelming at first, especially if you are not accustomed to cooking from scratch. Take it slow. You might consider a one month prep where you become familiar with gluten-free, whole foods cooking without going on the full elimination diet. We have a series of FREE elimination diet cooking videos here. You might also want to consider becoming part of our online paid support group. We have live webinars, cooking videos, and more in an online program hub. You can learn more about our Elimination Diet Support Program here. Can I go on the diet if I am pregnant or nursing? You can do a modified elimination diet while pregnant or lactating. See the book for details on how to adapt it for these stages of life. If you are pregnant you will follow a diet that is similar to the modification for children. If you are lactating you will want to follow the breastfeeding elimination diet guidelines, as there can be additional foods that can cause gas/upset in your infant. Can I put my child on this diet? Yes, but skip Phase 1 (detox) and move right into Phase 2. An elimination diet can be very beneficial for a child who has eczema and other skin disorders, asthma, multiple food and environmental allergies, as well as neurologic and behavioral disorders such as sensory processing disorder, learning disabilities, ADD, ADHD, autism, migraines, and epilepsy. Our program is designed to calm the immune system and restore nourishment by removing the most common irritants while offering nutrient-dense foods. Plus, our recipes have been tested and approved by our five children! I’m vegan. Can I still follow your program? Yes, with careful planning you can follow this diet as a vegan. If your symptoms do not improve then you might consider eliminating grains and legumes, which can make the diet too limited for some who are already on a vegan diet. We recommend you visit our recipe blog NourishingMeals.com for additional vegan, elimination diet recipes. I follow a Paleo diet. Are there enough recipes for me? Yes. Our program is filled with grain-free and legume-free recipes so you can get all of the benefits of the elimination diet if you are on a Paleo diet. I am on day 10 - 12 and I feel no change. Should I be feeling different by now? For some people it may take 21 to 60 days (and even longer) to detoxify from gluten and dairy and to begin to feel better. You may want to consider a supplementation protocol to give you a boost. Visit the supplements page in our store to order our elimination diet supplement package. The green smoothies are causing gas and bloating. Is this normal? Yes this is normal for some people. As the gut detoxes, gut microflora will change. Your body may take some time to adjust. For some people, especially those with severely damaged guts, the gas and bloating could be caused by a fructose intolerance (or FODMAP sensitivity), gastric acid insufficiency, or a pancreatic enzyme deficiency. We recommend following the low-FODMAP variation of the diet detailed in the book. Also speak to your health care practitioner about utilizing gastric acid and enzyme support supplements. Can I drink coffee or tea on the diet? Wait to add coffee or tea until the challenge phase. Caffeine is a stimulant and affects liver detoxification. Herbal teas such as chamomile, mint, ginger, raspberry leaf, and nettle are fine.